Designed for the athletic trainer and sports therapist, "Rehabilitation Techniques in Sports Medicine" is the definitive guide to the management of sports injuries. 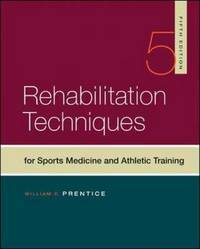 Experts from the field of sports medicine have contributed to this comprehensive, updated edition, which addresses all aspects of rehabilitation, including protocols for rehabilitating the wide variety of injuries athletes are prone to receive. Pros and cons of various rehabilitative modalities are discussed, as well as currently accepted techniques. This text is recognized as a handbook for any practitioners who manage rehabilitation programs for injured athletes.